Over four hundred million laser printers, inkjet printers and copiers have been waiting for the CardMate manual business card cutter. Turn your desktop printer into an instant business card maker. With the CardMate manual business card cutter you can stop paying to get your business cards produced. 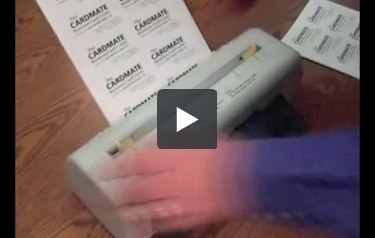 Create your own cards in an instant using this low cost machine. You can pay for the machine with your first project. Just insert your pages, turn the handle and cut your cards. Try it for yourself today. it is just what I needed. Love it. I love the ease in which I can cut my own business cards. The machine is a simple marvel. My only exception is some ridges in the output tray that inhibit the outflow of some cut cards. Sanding it down should do the trick. It's important to have a smooth outflow tray. I would buy this item again and recommend it to others. I have been using this cutter for more than 10 years to make membership cards for a nonprofit organization. We have a pre-printed 8.5"x11" designed sheet with 10 card blanks to a page. We over print 10 individual's information on the sheet from the computer, run the sheet through the cutter and laminate each card. Smooth event edges that look professional. An easy task for volunteers. Getting ready to purchase for several other nonprofits. This cutter really works well. Great cuts on all of the card stock and papers that I tried. It's nice that all of the edges are straight and square. Cards are the same size just like commercial cards. We wanted to be able to make our own business cards in house but needed them to be consistent. We initially tried to cut them with a paper cutter but it was just too hard to get them to come out even and uniform. With this the cards look right every time and the price was decent. If we did more cards I might want an electric one but for our volumes the cardmate works great. 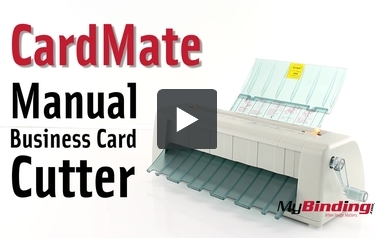 The Cardmate is a manual business card slitter designed for short run applications of standard 2 x 3.5 business cards. Using business card template software that is readily available, you can print your own custom business cards 10 up on an 8.5 x 11 sheet of paper. The Cardmate will work with a wide variety of card, cover or index stock. Generally, if the paper will run through your black and white or colour copier or laser printer, it will run through the Cardmate. Setup is easy, simply place your 10 up sheet of paper 8.5 inch side forward. Put it into the rear slot on the Cardmate. You'll notice on the Cardmate, there are adjustments to adjust for your margin setting. Put your sheet into the machine and simply turn the crank. You then get two sheets 11 inches x 3.5 inches. From there take one of these sheets, place it into the forward slot on the Cardmate and here again you have adjustments for your margin settings. Set your margin settings and turn your crank and you are left with a perfect 2 x 3.5 business card. An important thing on the Cardmate is to only cut one sheet of paper at a time. Cutting more than one sheet of paper at a time will damage the unit. So that is a very important thing to keep in mind. This standard business card cutter will cut roughly about 60 cards in 60 seconds, no power required and works with all standard business card programs. Transcript: This is the CardMate Manual Business Card Cutter! Cutting your own business cards is incredibly easy with the Cardmate. All it takes is three simple cuts to come out with 10 business cards. This means that in less than ten minutes you can easily have 100 or more business cards perfectly cut. So lets go over some features. It has a collapsable design for easier storage. The back tray folds open, and pull the front open. This is the CardMate Manual Business Card Cutter! On the left side is a mark for standard letter size pages. Set the edge of the guide to this position—on the back, the wheel has a red mark for this position. After a test page you may find it will need some minor adjustments. Now with the left sides set, put a page in and adjust the right side. With the guides you can see approximately how well your cuts will line up. This is for cards with a non-bleed design. That means that the design within the card does not come to the edge. This is because when it is cut, there is no separation between the card next to it. So with a bleed design, it’s almost impossible not to get part of the other card’s image onto the wrong card. I will greatly stress to only cut one sheet at a time. If you try cutting more then one, it could push the blades up to where they will stop cutting your cards completely. And this is not something that is easily fixed by yourself. There are instructions and helpful tips on the back tray with design tips and cutting tips. And it cuts a sheet of ten cards each. Most modern businesses have a staggering amount of expenses, including the cost of supplies. Business cards are one of those expenses and the cost of them can really add up, especially if an outside firm creates them. Having the ability to create business ID's in-house can really lead to some substantial savings and due to the popularity of high quality color printers, this is a possibility for many organizations. However, once the cards are all printed, the task of cutting them remains. That's where a cutter can be helpful and one of the latest ones to hit the market is the CardMate Manual Business Card Cutter. This new device has a bunch of strengths and a few weaknesses. Continue reading to learn about this machine. Then you will know if this product will be a good fit for the needs of your organization. First and foremost, this machine offers users an inexpensive way of creating their own business cards. The unit's price is in the neighborhood of $100.00 and since most users will already have a printer, computer, and software, this product is a great option for people who need business cards but don't want to put out the cost of having an off-site print shop do it. The CardMate is very easy to use and anyone could learn how to use it in a matter of minutes. It can feasibly cut up to about 60 cards in the same amount of seconds. This device is capable of dealing with everyday bond paper as well as card stock. This is a very lightweight product that only weighs 6 pounds. Because of its weight it could be shared easily amongst several different departments which could help users save even more money. In addition to not weighing much, this item is small enough to find on just about any surface. It measures 15.5" x 6" x 5.5". No power is required to operate this machine. It can be used anywhere. Although the machine can cut cards pretty quickly, it is disappointing that you can only cut one sheet at a time. Being able to cut multiple sheets would be a real time-saver. The housing of this device is made out of plastic which is hardly the most durable material out there. If you use this device a lot, you may have to replace it eventually. You can only cut cards that measure 2" x 3.5". While this is a standard business card size, it would be nice if you could cut different sized cards. It would definitely make the CardMate more versatile. Many customers have asked if this machine allows you to adjust the cutting size or margins. Unfortunately, it does not. The device only has a limited 90-day-warranty. The CardMate Business Card Cutter is an adequate machine that would be good for light use in your office. It will definitely save you some money but it would be better if this device could cut more than one sheet of paper at once. If you need a simple cutter, this machine would be a good, inexpensive choice. A good business card is a must-have item for any professional, but sometimes the cost ofhaving such items made can be a bit prohibitive. One solution is to create your own cards on your Mac or PC. However, in the past, cutting them could be difficult because it can be hard to cut in a perfectly straight line with scissors and there’s always a chance things could go astray when using a craft knife. Although there are card cutters already on the market (and they are almost always pricey), few are as convenient and affordable as the CardMate Manual Business Card Cutter. This is a great new gadget that will make creating your own business cards ridiculously easy. Here’s how you use it. Design your own! Designing your own business cards can be fun and you can do it with a lot of different software packages, including the ever-popular Microsoft Word. When you’re satisfied with how your work looks, print it out on your laser or inkjet printer. The CardMate can cut letter-sized bond paper as well as card stock, so choose the paper you like best. Make sure that there 10 cards on your paper and that they each measure 2″ x 3.5″. There should be a 3/4″ border on the right- and left-hand sides, and a 1/2″ border on the top and bottom. You can download a card template off of the Internet to help you get the right dimensions. Get ready to cut. When you’re ready to cut, take your paper over to the CardMate. Place one sheet of paper in the rear feed tray and make sure it’s snug, but not too tight. When your paper is lined up, begin turning the handle. In a short amount of time, you’ll have two 11-inch long strips with your work on them. Then, take one of the strips and put it back in the forward feed tray horizontally. Then turn the handle again. Just about instantly, you’ll have perfectly cut business cards. Repeat the last step with the other strip, and then repeat the whole process all over again if you have more items to cut. Please note that you should only cut one sheet a paper at a time. Attempting to cut more will just end up damaging your device. As you can see, the CardMate is really easy to use. If you follow all the steps correctly, chances are you’ll be able to cut up to 60 cards in about a minute. And, perhaps best of all, this little gadget is very affordable. You can purchase it for around $100.00 and when you consider how much it costs to have someone else design and print your business cards, buying one of these units seems like an extremely cost-effective move. The CardMate Manual Business Card Cutter is the machine to use when you want to save money on your cards. Considering business cards are a staple of professional life, having one of the devices makes a lot of sense…especially since it will help you save money. Thank you for your question. Unfortunately we do not have any business card cutters that are designed to with A3 sized stock. All of the Card slitters we carry are designed to work with 8.5"x11" US Letter Sized stock. is there a manual one that can cut 12 cards instead of 10? Thank you for your question. Unfortunately we do not have a manual card slitter that would be able to cut 12 sheets at a time. The CardMate Manual Business Card Cutter is the only manual model we currently stock. is there a version non-bleed for 12 cards per sheet? Thank you for your question. Unfortunately we do not have a manual card slitter that would be able to cut a 12 up non bleed card sheet. The CardMate Manual Business Card Cutter is the only manual model we currently stock. Thank you for your question. The CardMate Manual Business Card Cutter would be able to cut 240 gsm stock in a limited quantity. Using the machine to consistently cut that heavy of stock would add additional wear to the machine and shorten it's overall lifespan. Is that this machine can cut A3 paper for size 84*58mm? Thank you for your question. The CardMate Manual Business Card Cutter would not work with A3 paper, it is designed to cut down US letter sized paper into 10 business cards. The blade are fixed and unfortunately would not be able to be adjusted. Can we use paper size A4 instead of letter size? Thank you for your question. The CardMate Manual Business Card Cutter would not be able to work with a A4 sized sheet. The blades are fixed and set up to be used with the template that is designed to be used with US letter sized (8.5"x11") stock. Are the blades replaceable? Or can they be sharpened? Thank you for your question. Unfortunately the blades on the CardMate Manual Business Card Cutter are not able to be replaced or sharpened. Will the CardMate Manual Business Card Cutter cut different size cards besides the 2 inches by 3.5 inches? Thank you for your question. The blades on the CardMate Manual Business Card Cutter are fixed and only able to cut a 2" x 3.5" business card out of a 10 up pattern on a letter sized sheet. What is the maximum paper weight can it take? Will this accept 100lb paper? Thank you for your question. The CardMate Manual Business Card Cutter would be able to work with up to 110# card stock. Is this machine for 90*50 mm? Thank you for your question. The cards made with CardMate Manual Business Card Cutter measure 2 inches by 3.5 inches which is approx. 50mm x 90mm. Can the machine cut business cards with a bleed? Thank you for your question. The CardMate Manual Business Card Cutter is only set up to be able to cut Non-Bleed cards.